We stopped by Andy & Vicki's room the Wed evening before the SBE, like we always do to check out their latest works for the show. Andy slowly pulls each cue out of the case and we just stare awaiting each cue to be revealed. Well, when this cue was being pulled from the case I said that's mine! 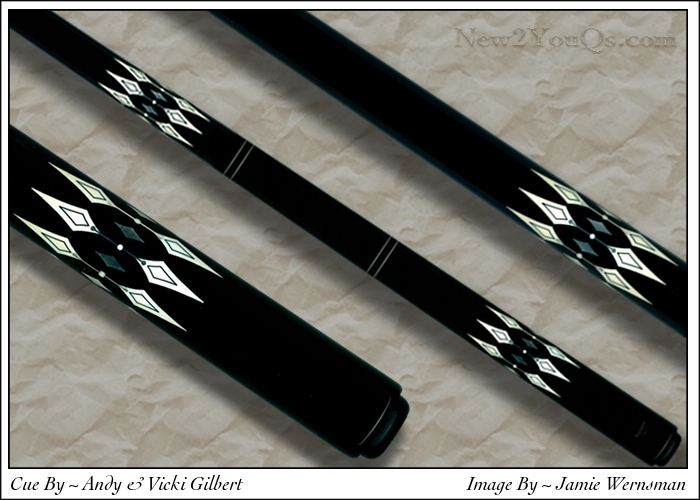 Even though it is a little out of the Ebony on Ebony realm from a purist's standpoint, I found the cue to be unique, elegant, and refined. There is no way I can capture it's beauty in the way I compose my images... believe me I've tried. It's the newest member of my collection, and I love it! Did he use silver on the diamonds between the spearheads? I can understand why you bought it. Excellent cue! Yeah, need more pics, I love your photo collages but hoe bout a close up of the inlays and a discription and also how bout a pic of the joint. Andy and Vicky have been all over the map with uniques designs and their work just keeps getting better, LOVE it. Storage space is cheap these days. Use more efficient compression and leave the pics at higher quality and resolution. I have a 1TB storage hard drive that can hold around 5 million copies of that photo, and I got it for $75.